A termite queen lays approximately 30,000 eggs per day. About 1 per second. Any of numerous pale-colored, usually soft-bodied social insects of the order Isoptera that live mostly in warm regions and many species of which feed on wood, often destroying trees and wooden structures. Also called white ant. Termite, common name for numerous species of social insects that cause damage to wooden structures. Most of the about 2000 known species are distributed in tropical countries, although some inhabit North and South America and two species inhabit Europe. Termites display patterns of social behavior that are almost as elaborate as those of the ants, social bees, and wasps. Termite colonies, which may number from 100 to more than 1 million termites, have several different castes of termites with different functions in community life. Three principal castes exist: the reproductives, the workers, and the soldiers. The reproductives, or the king and queen, produce eggs. In some tropical species, the queen grows to an enormous size, sometimes as much as 20,000 times the size of the worker. A queen can lays eggs at a rate of about 30,000 a day in some species. Apart from the reproductives, all castes are sterile and wingless and have whitish bodies. The workers are the most numerous caste and are the smallest adult form. Workers build the nest, tend the eggs, and feed and groom all the other members of the community. All species have soldiers whose role is to defend the colony. 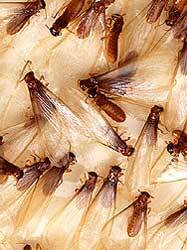 Termites feed mainly on wood or other materials containing cellulose. The cellulose is partially digested by protozoans living symbiotically in the intestines of the worker. Enzymes produced by the protozoans break the cellulose down into parts that can be digested by the termites. Some species feed on vegetable molds that they cultivate. The nests of certain tropical species are huge moundlike structures, often 6 m (20 ft) in height. They have hard walls constructed from bits of soil cemented with saliva and baked by the sun. Inside are numerous chambers, interconnected by a complex network of passageways. Most termite species in the United States build their nests underground. These termites are destructive, tunneling their way to wooden structures into which they burrow to obtain food. Scientific classification: Termites make up the order Isoptera.